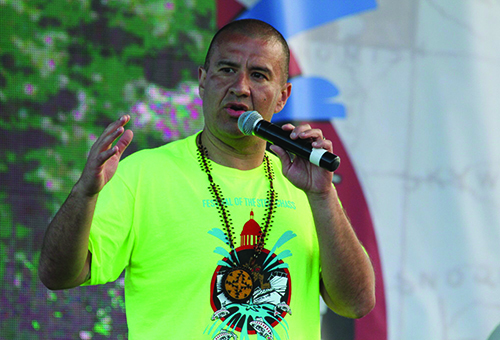 Native American rapper Taboo from the Black Eyed Peas headlined the Festival. Pre-colonization, the Port of Olympia was once a plentiful estuary that was occupied by the Steh-Chass people on Squaxin Island territory. Salmon swam in abundance through the inlet and there was no shortage of wildlife in the estuary, providing food for the Steh-Chass community comprised of a number of tribal members from Squaxin Island, Nisqually, Chehalis and Suquamish. The Salish Sea waters freely flowed from the Puget Sound through the estuary along the Deshutes River, ensuring nourishment for the people. As time passed, the area eventually became the home to Washington State’s capital and in the 1950’s, the state built a dam on 5th Ave. The dam separated the lake from the Puget Sound, creating a reservoir used to reflect the Washington State capital building on its surface. The once bountiful estuary is now a decorative body of water known as Capital Lake where currently no native wildlife reside. Not to mention that nearly every spawning season since its construction, the dam has been home to a number of seals who pick off salmon attempting to swim upstream. Billy Frank Jr. was a strong advocate for the removal of the dam. Salmon Defense, a non-profit established by the twenty Northwest Washington tribes, continues his vision today, years after his passing. And for nearly three decades, the Deschutes Estuary Restoration Team (DERT) has been fighting the same fight, actively working to reconnect the reservoir back to Puget Sound and restore the estuary. Over Labor Day weekend, Salmon Defense and DERT teamed up, along with the Tulalip, Puyallup, Nisqually and Squaxin Island tribes, to host a festival celebrating Indigenous culture while honoring local tribes and the water in the name of salmon recovery and estuary restoration. 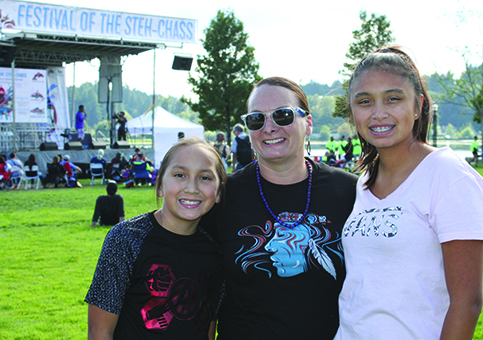 The first annual Festival of the Steh-Chass was held September 1, at Heritage Park in Olympia overlooking Capital Lake. The weather was sunny and clear and a stage was setup at the center of the park where the Washington State Capital was visible in its background. The start of the festival, however, began at the 5th Ave dam as tribal members and Olympia community members welcomed the canoe families of Squaxin Island, who pulled into the Port in traditional cedar canoes. The crowd then followed the canoe family as they sang the traditional songs of their people while walking through Heritage Park. 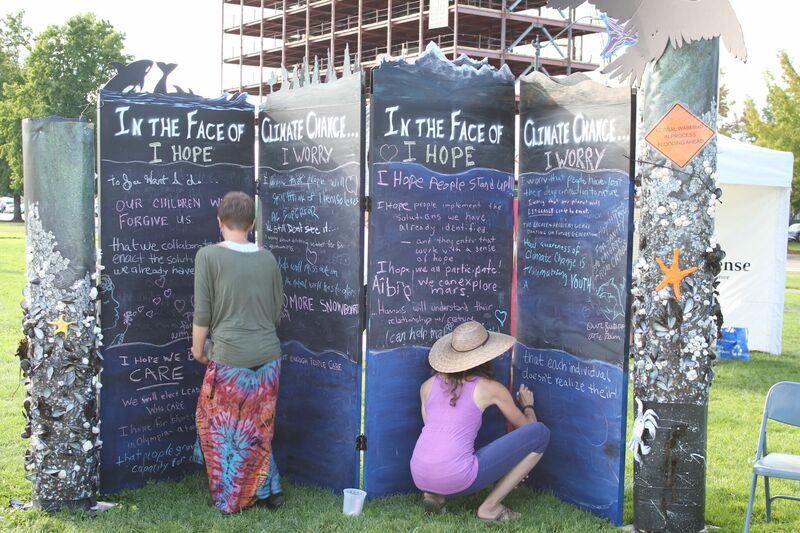 “What we wanted to do with this festival is create a space for Indian people to gather, talk, sing and celebrate Indian people and reawaken the Indigenous spirit of this area,” says Salmon Defense Director and Willie Frank III’s wife, Peggen Frank. “The Salmon Defense has been wanting to do something to raise awareness for the salmon, for the crucial state we’re in. The salmon are collapsing and it’s really scary. For me, as a tribal person, the reason why I’m fighting for the salmon is not only because of what [Billy Frank Jr.] taught me – and that’s when salmon are healthy, we’re healthy and without clean water we won’t survive – but the coastal people have a beautiful culture and the salmon are a vital piece of that culture. Information booths were stationed along the park’s walkway from organizations such as Northwest Treaty Tribes, Salmon Defense and DERT. 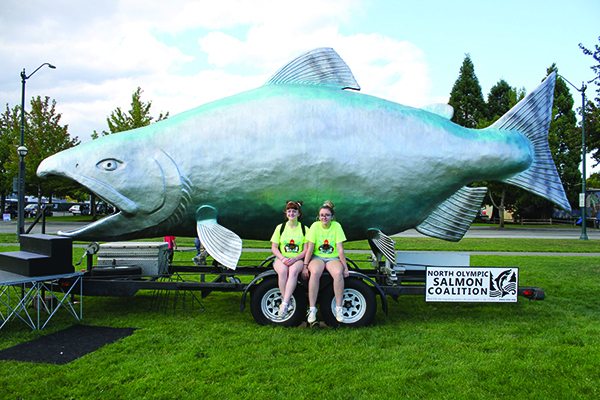 Children got to enter the belly of a giant salmon, named Finn the Fish, and learn about the watershed habitat through traditional art that was painted on the inside of the fish. 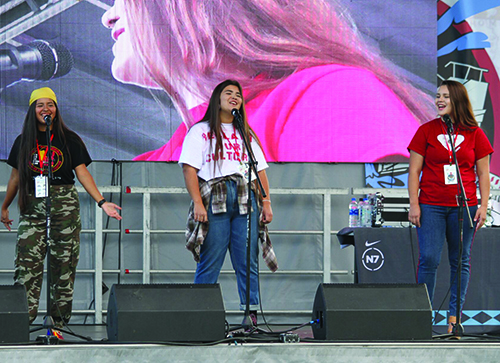 As the day progressed a number of talented Native American singers and artists took the stage, including Suquamish singer and WaterIsLife activist, Calina Lawrence, as well as singing trio, Thunderbirds Raised Her, who are a group of young sisters from Lummi. The crowd was moved by both acts as they sang about important issues in Native America like protecting the water and growing up on a reservation. The songs were in contemporary R&B fashion while incorporating elements such as hand drums and their traditional language into the music. Several other Native performers kept the crowd entertained throughout the day including Seattle hip hop artist Momentum X and the Indigenous Sisters Resistance group, as well as a fashion show by Indigenous Designer Abriel Johnny. The festival’s headliner did not disappoint. 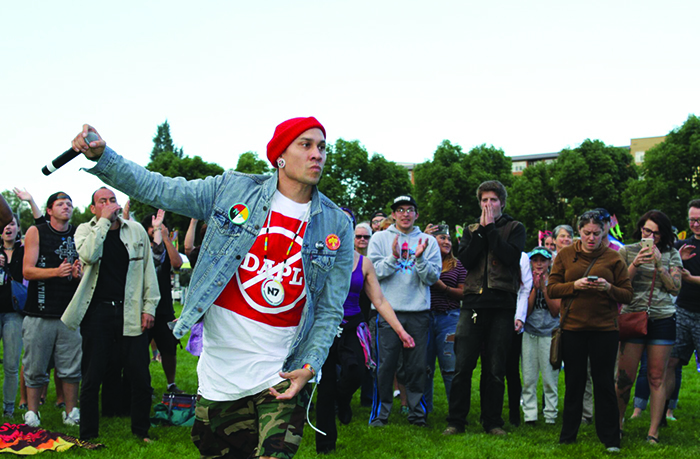 Event goers rushed the stage as Native American rapper and advocate, Taboo from the Black Eyed Peas, began to perform an array of the hip hop group’s hits that had the crowd dancing. About halfway through his set, Taboo asked the sound crew to cut the music so he could talk to the people about protecting our natural resources. He explained that he was so moved by the NODAPL movement that he postponed recording a new project and tour dates with the Black Eyed Peas to ‘go to Standing Rock to be with my people’, after receiving full support from bandmates. Taboo also spoke about the resiliency of Indigenous people before performing his MTV Video Music Award Nominee song, Stand Up/Stand N Rock. Following Taboo, Willie Frank III took to the stage to close out the Festival of the Steh-Chass. “As we talked about all day today, the message is to make this lake flow into our Puget sound, make it an estuary again and bring the salmon back to Capital Lake,” he passionately expressed. “It’s so good to see all these youth out here taking part in this, they are truly our next generation, they are our future. Our elders are the most important piece of our culture and now we have the youth coming up, and we’re going to educate them. We’re going to do what we need to do to protect our salmon, to protect our natural resources.